You know I like cheesecake… you also know that I suddenly love phyllo dough. What you may not know is that when the two are combined, it fills you (me) to the brim with love and happiness. So, we had some phyllo dough laying around… and you’re not really supposed to keep it for long as it will dry out. 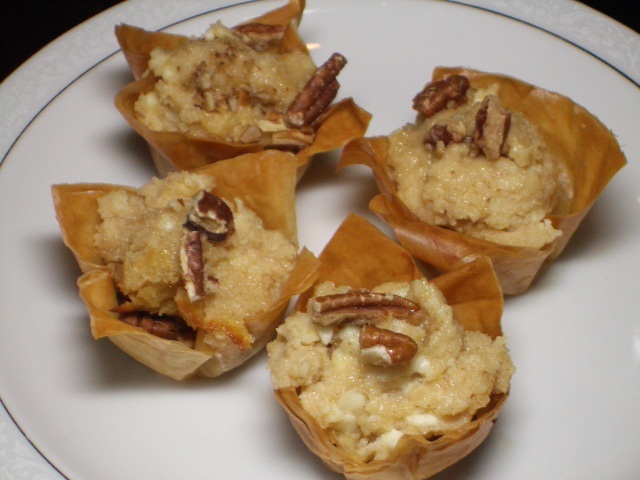 We had to think of a way to use it up – and this is what we came up with…little phyllo cups filled with pecan pieces and honey and a cheesecake-y mixture. I feel sure that this is one of the most fabulous ideas we’ve ever had. The not-so-fabulous part of the whole ordeal is that we each ate WAY too many of these over a two day period. Darn. I just saw this randomly! These look great…I can’t wait to try something like this.